gesture | Unity and Ubuntu – Tweaks you must know! It’s always interesting to see Ubuntu grace the pages of the popular press – even when it’s not referenced directly. An article on the BBC News website today, June 5th, is one such occurrence. The piece concerns gesture-controlled tech able to read movements based on disruptions to Wi-Fi signals. The main post image of the piece is a screenshot of the tech being run on Ubuntu. 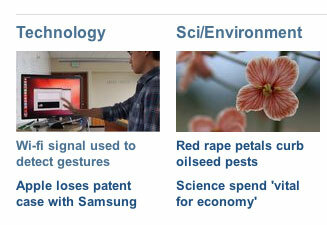 That grab is also currently showing up on the BBC News front page, too. That’s certainly true. It is great to see Ubuntu being used in the building of tomorrow’s technology. But hey – a guy needs an angle! In the following video put together by the research team you can see Ubuntu in use several times. The application itself looks as though it’s written in Java. For more information on the WiSee, the team behind it and its potential uses head over to the BBC News article or the University of Washington webpage. This entry was posted in bbc, gesture, News, Random, ubuntuinthenews on June 5, 2013 by unityadmin.